This “50 Years, 50 Stories” installment was provided by Aneta during a face to face interview with her at Imagine!’s Foothills Group Home in Boulder, Colorado, where Aneta lives. Aneta has been receiving services from Imagine! for more than 30 years. I moved to Boulder from Arvada about 30 years ago, and I moved into Carmel House. I didn’t know anybody and I was scared. Jim Graves (the Director of Carmel) was a nice guy and he helped me to be more comfortable. He helped me to make new friends. During the day I went to the workshop (on Broadway and Iris in Boulder). I took a taxi, and that in itself was quite an accomplishment to get into the taxi cab. When the taxi showed up and they said “Are you ready for work?” you better be ready and have what you needed for the day. I learned how to take care of myself. Today I wanted to share a story (and video) about two young men who receive services through Imagine!’s Autism Spectrum Disorder (ASD) Program. This unique program offers families who live in Boulder County and who have child on the autism spectrum, but do not otherwise qualify for services from the State of Colorado, an annual allocation of funds for three years. Each family directs the funds for their family member to the treatment of specific areas of need. This is probably one of the best examples of self-directed services in the State of Colorado. In this case, the families of Cole and Ryan (seen in the video below) used some of their ASD Program funding for neurologic music therapy (NMT) to help the children work towards their social and communication goals. With their parents’ permission, Amanda Bryant, a Board Certified Neurologic Music Therapist, recorded a performance of Cole and Ryan playing the drums and entered it in an arts competition at their school, Lafayette Elementary. Check out their performance below. The arts completion was part of the PTA Reflections program, designed to encourage students to explore their talents and express themselves by giving them positive recognition for their artistic efforts. 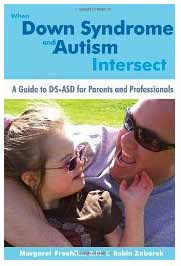 Congratulations Cole, Ryan, Amanda, and Imagine!’s ASD team for making this happen. Thanks to Cole and Ryan’s parents for letting us share their story. OK, this week’s “50 Years, 50 Stories” contributor might be familiar. I’m not doing this because I have a huge ego (though some may argue otherwise – but hey – at least they are talking about me!) I’m doing it because I have loved my time at this organization and wanted to share some of my own memories. And, with my piece, it means we will have started the series off with all four Imagine! Executive Directors. I think it says something very positive about the organization that in 50 years, only four people have held that position. Finally, I hope to inspire others to participate as well. If you have a story to tell as we celebrate 50 years, check out the bottom of this post to see how you can participate. Anyway, here are my memories and musings. Some people know that during my 1983 interview to be an instructor at the DDC, I was asked, “what sort of an organization was I looking to work for?” I wanted to work for a progressive, forward thinking organization. I was looking sharp in my impressive attire, which included sneakers with velcro straps. Probably due to a weak pool of applicants, I was hired. Little did I know, John Taylor had just been hired as the new Executive Director. Later I would come to know what a fortune this would be for me. John knew how to engage a community. This would be a huge lesson going forward. I promised my new coworker, Gary Stebick, that this would be my last stop in my human services career, and my next career move included driving a tractor trailer. Gary, unimpressed by my commitment, let me know that he, too, would be moving on in six months. To this day, we’re both at Imagine!, and we both still look at each other in wonder. What might have the DDC become - and didn't? People I worked with over the years - and you know who you are - inspired me. You took me down the road of curiosity; a road of fun and adventure; a road of disruptive innovation and creation. You created an atmosphere that attracted more of the same; intelligent people who listened, paid attention, and never ever settled for the status quo. Bold people who are driven to always find a new and better way to do things. And now we are Imagine!. This is your invitation to fill in the blanks of the last 50 years; the events, the relationships, the developments, and the life-changing moments that have contributed to the Imagine! we know today. For me, Imagine! has a magical atmosphere. It is organic. We ask really difficult questions of ourselves and others. We do this with a common purpose; to allow others to thrive, and in so doing thrive ourselves. Our journey will continue. The vehicle will be the same; curiosity, fun, adventure, and innovation. Like a two wheeler, this vehicle must stay in constant motion and cannot come to rest. Our interest in emerging technologies and cognitive prosthetics will offer people we know opportunities that we now only imagine. Yes, Stebick, there really is a Santa Claus; a magical place where what we imagine can come true. If not for you and the host of others we know, I would certainly not be here today. Look at what you have done. Imagine what we will do in the next 50 years. Bonus picture: here's a shot of my very first job location at Imagine! While it's well known that the incidence of autism spectrum disorders (ASD) is skyrocketing in the general population, it's less well known that ASD is even more common in people with Down syndrome. “When Down Syndrome and Autism Intersect” offers a thorough examination of the unique profile of a Down Syndrome-Autism Spectrum Disorder (DS-ASD) diagnosis and best practices for screening, treatment, and caretaking through the lifespan. This one-stop resource, the first of its kind, will greatly benefit families whose child is already diagnosed, and also those who suspect something more than Down syndrome. Professionals, too, will find information on how to distinguish DS-ASD from a diagnosis of just Down syndrome, and guidance on providing services for children and adults. Sam’s chapter is well written and easy to understand for the lay person, yet still contains important and relevant insights for veterans in our field. Learn more, or purchase the book, by clicking here. Way to go, Sam! Thanks for being such a great ambassador for Imagine! and the people we serve. Some people can take the simplest things, like getting out of bed and making breakfast, and turn them into something unbelievably complex. While complexity can be enjoyable at times, when we are talking about a system designed to help individuals with cognitive disabilities, I think most people would agree that convolution is not a goal to be aimed for. Oddly enough, when navigating our system of supports, I totally relate to the little dog Speck for what he is witnessing. And so here we are again, trying to figure out how best to serve individuals in our state who have one or more developmental disabilities. And yet again, one has to wonder, are we missing the forest for the trees, and looking for complex solutions to challenges while ignoring some of the most obvious and simple answers that already exist? So today I am presenting three simple approaches to creating a better system for serving some of our most vulnerable citizens. Pay for outcomes, not for units of service. When providers are paid for units of service, they no longer design their services to meet the needs of those they serve. Instead, they design their services to meet the needs of regulatory organizations. The result is a costlier system that provides fewer overall benefits. Paying for outcomes will reverse that equation and, therefore, the results. Find out the demand for services. We have a woefully inadequate knowledge base when it comes to how many people need services in our state, and what services are actually needed. It is time to start using the principles of Demand Management as part of a plan to provide services for individuals with cognitive and developmental disabilities here in Colorado and across the nation. But in order to do that, we need to know what the demand is in the first place. Look to the providers. Providers have been the ones coming up with creative and cost effective ways of providing services that have truly been revolutionary. Discover what providers are doing successfully, and look for ways to replicate those efforts across the state. Those three simple solutions would go a long way in creating a system that benefits the end users, which in turn, would benefit the entire community. This isn’t complicated. We have the solutions. It is time to embrace them for the good of us all. This week’s “50 Years, 50 Stories” is another story from a former Imagine! 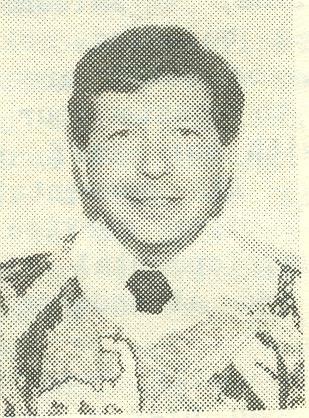 Executive Director: John Taylor, who served as Executive Director from 1983 to 2008. John was my predecessor, and I am eternally grateful for the guidance and assistance he gave me when I took over his job, and continues to give me today. John left me with some very big shoes to fill, and I can only hope that my tenure as Executive Director will prove to be as successful and impactful as his was. Please enjoy John’s memories below. I find the story of how we came to be called “Imagine!” (including the exclamation point) both fascinating and revealing. Imagine! 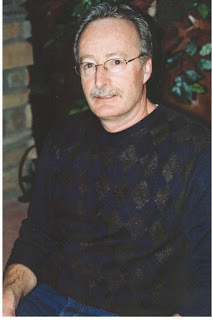 , if you can, the perplexity you would experience if asked to share one story or several “reminiscences” of the past 50 years of your life in 500-700 words. Quite a challenge to pick a few memories out of the myriad of events and people that filled my life during my tenure at Imagine!. But I persevered, and here are a few that seem to bubble to the top of my memory soup. Richard T., and his unbelievable memory and grasp of sports trivia, and how he so impressed a visiting delegation from Holland with his knowledge of international football (soccer) and the performance of their own national team. The many families that were started and which grew here at Imagine!. I have, perhaps, no fonder recollection of my time at Imagine! than those of the marriages of staff to staff that occurred, and the number of their children that we all had the pleasure of watching grow into wonderful young men and women. Sitting on the rim of Bryce Canyon in the early 90’s, trying to combine a vacation while working with Sarah Clark on the annual budget. Technology came to the rescue. The ability to connect my then bulky Toshiba laptop to my almost as bulky cell phone let us develop the first “long distance” budget for the “DDC”. Names-how many were there? Let’s see: I believe the first was the “Boulder County Interagency Coordinating Council for Mental Health and Mental Retardation”-quite a mouthful. Then, when I was hired in 1983, we were known as the “Boulder County Board for Developmental Disabilities”, frequently shortened to BCBDD—but still enough to choke you when answering the phone. But then came the shortened version, the “Developmental Disabilities Center” (“center” was big in naming non-profits at that time). But when we ran our successful mil-levy campaign in 2002 with the superb assistance of Pete Burridge and Greenhouse Partners, it became evident that, for the following reasons, we needed to look for a new name. The future of the organization will serve those with challenges other than developmental disabilities such as senior dementia and other challenges associated with aging, physical challenges (e.g. blind, paraplegic, deaf, etc. ), and young children with developmental delays), etc. The “Developmental” and “Disabilities” in the name are limiting. The DDC is often confused with the Center For Disabilities, another Boulder organization. The DDC lacks emotional appeal and understanding. The name is long, cumbersome and difficult to say and remember. Because of the word “Disability,” some people associated with the DDC and/or their sub brands avoid highlighting their association with the DDC. The criteria that we specified in this naming odyssey was detailed in a 2002 memo to all staff: “One word if at all possible; easy to say (rolls off your tongue well); evokes positive emotions; easy for consumers to say and remember; not overly used already; could be a “made up” word; doesn’t include “Boulder”; 3 syllables or less if possible; fits our “personality”; etc.” Through the use of focus groups, name searches, and brainstorming, we narrowed our choices down to 4 possibilities: Innovista, Dimensions, Innovita, and Imagine. I think we chose well. But how did we end up with the name, Imagine!? Unfortunately, the name “imagine” was already registered in Colorado and the company that owned it was reluctant to part with it. Eric Love, then on the Imagine! Board of Directors, had learned that punctuation was permitted in a name for the first time. So with a lot of hustle and through the use of couriers to beat a deadline, the brilliant thought of adding the exclamation point! came to fruition. Now you all know the story. The first staff/Board retreat, probably around 1985 or 86. We held it at the Double JK ranch (I think that is right) up near Estes Park. There were only about 40 staff members in the entire organization, and probably around seven Board members. Our main task at the retreat was to choose our very first computer system (we only had one computer when I arrived in 1983, and we all fought for it!). We had a presentation by Unisys, and went with them, which worked for us briefly. But we rapidly outgrew its capabilities. How times have changed. The building of our main offices at 1400 Dixon in Lafayette was the result of cramped space for both the DDC and the Mental Health Center. At the time, we enjoyed the “rights” to a 50-year lease in the building in Boulder that housed our offices as a result of the funding sources that paid for the original construction of the building. But we were growing, and space was expensive. Though a wonderful bit of serendipity, the then-director of the Mental Health Center (Phoebe Norton) and I were able to work out an arrangement with the Boulder County Commissioners that provided much needed space for the Mental Health Center, helped Boulder County proceed with plans to relocate Human Services to the Iris and Broadway location, and let us trade our “rights” to the space for much needed funding to pay for the construction of our new home. As a result, we are known as a quality not-for-profit, not a department of the government, are located centrally for our service area (Boulder and Broomfield Counties), and are able to attract staff from a much larger geographic area. And it is OUR home! My trek down memory lane would be incomplete (well, it is anyhow!) without acknowledging the many friends and colleagues (and their families) that left their imprint in my heart and mind: staff, consumers, Board members, Foundation Board members, legislators, business leaders, State staff, and the many community supporters. They made all the memories possible and worthwhile. Thanks! Did you know that Imagine! has a Host Home program? Staff members from Imagine!’s Innovations department work very carefully to ensure that Host Home providers and consumers are well matched. A wide variety of criteria are used to find the best fit. Maybe one person would prefer to live in a mountain home with plenty of peace and solitude, while another person would prefer to live in an apartment in the middle of town where they have easy access to friends and fun events. The process of carefully matching consumers and providers means that the consumer has the opportunity to live the kind of life he or she would like, and is able to access the community in more successful and meaningful ways. The results that come from using this model have been impressive. Many Host Home Providers have been together with consumers for more than 15 years. So today I’d like to highlight a few of Imagine!’s Host Home Providers, and thank them for their service. Mark S. moved in with Roy and Iva about four and one-half years ago to their home in Loveland, Colorado. Ray and Iva’s compassionate medical care, family oriented home life, and genuine fun loving approach toward being host home providers has lead to success for all involved. You will often find Mark, Iva, and Roy cracking jokes, out fishing, bowling, or just hanging out in the community with friends. The Richters also bring consistency, responsibility, and great skill to what they do. Andrea Legleiter and Derek Voth have been providing services to Innovations’ consumers for seven years. Currently, Andrea, Derek, their consumer Nicholas, and their foster child Jason currently reside in Westminster. 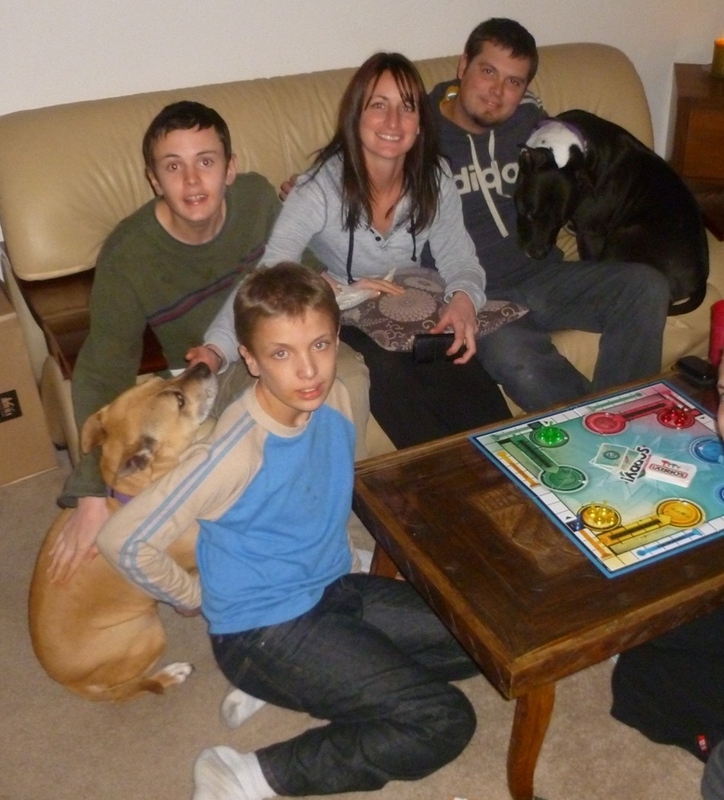 Andrea and Derek consistently provide thorough care and advocacy to both Nicky and Jason. Andrea and Derek’s quick attention to detail saved Nicky’s life this fall when they took immediate action and administered the Heimlich Maneuver when Nicky was choking. Andrea and Derek’s energetic care also translates during their leisure time as well. Together Andrea, Derek, Nicholas, and Jason (pictured above) fill their summers with camping trips and swimming in the pool in their backyard, but in the winter months you can find all of them having a good time while chanting in unison at the TV. Andrea and Derek are both from Kansas, and are proud fans of the Jayhawks basketball team. Their enthusiasm for the Jayhawks has also been adopted by Nicholas and Jason as they too enjoy watching games with Andrea and Derek at their home or out over dinner wherever the game’s on. Andrea says, “They proudly wear their Jayhawk gear and chant 'rock chalk Jayhawk' when we win!” Andrea and Derek are successful at creating a family atmosphere for both Nicholas and Jason, and Andrea admits that the Jayhawks have a little something to do with that. “Most all of our extended family members are also proud Jayhawk fans, and this has helped the boys to have a sense of belonging in our not-so-traditional family,” she said. Imagine! consumers Chris and Bruce have lived with Kathy and Chris Wallace for many years. Kathy uses her great sense of humor to maintain an upbeat residential environment. She has an uncanny ability to sense concerns before they arise and skillfully assists her consumers to advocate for themselves when necessary. Chris and Bruce both continue to thrive in their host home thanks to the unwavering support provided by Kathy and her husband. Bruce said, "I have lived with Kathy and Chris for eight years. There's an assortment of things I like about my host home, it's hard to choose just one. I really like living there in general. Kathy and Chris are funny and we laugh a lot together." 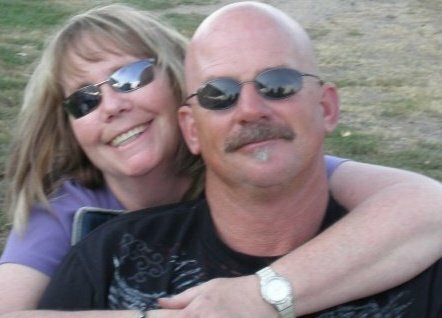 Chris said, "Kathy and Chris always help me when I need it." Thanks to all of Imagine!’s Host Home Providers. Welcome to another edition of “50 Years, 50 Stories,” where we celebrate Imagine!’s 50th Anniversary with stories from many people associated with Imagine! over the years. Last week, I started out this ambitious project with a recollection from Ruth Wood, who was the first Executive Director for what was to become Imagine!. This week I will continue with the theme of stories from former Executive Directors by sharing a remembrance from Don Coloroso, who served as Executive Director from 1976 to 1983. 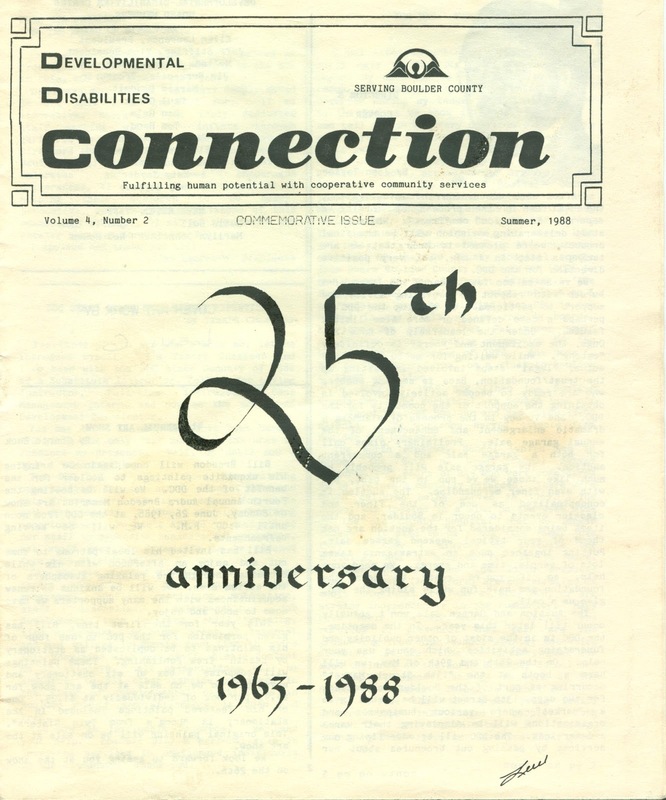 Like last week’s story, this is also taken from a 25th Anniversary newsletter put out by the Developmental Disabilities Center (Imagine!, before Imagine! was called Imagine!). Don’t worry, starting next week we’ll have brand new stories to share, but I like the idea of starting out these stories by providing a little historical perspective. So without further delay, here’s Don Coloroso writing in 1988 about his experiences. I arrived at the then BCBDD (Editor’s note: BCBDD was the acronym for the Boulder County Board for Developmental Disabilities, an earlier name of Imagine!) from my position as Director of Family Services at the Weld County Community Center Board in Greeley, Colorado, in the Fall of 1976. 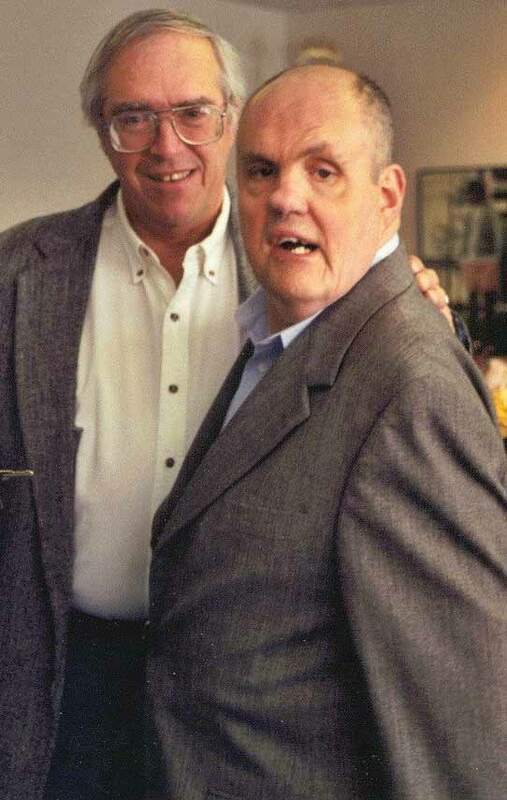 At that time, the Boulder program was already established nationally for its progressive programs to assist people with developmental disabilities. Highlights of my time at the agency include the opportunity to work with extremely competent and dedicated staff. I was pleased to see the expansion of residential options during my years at the Board. I also felt the agency’s added focus on the under five population was also beneficial. I saw as my goal enhancing support services to the people in the program and their families. I believed the board was a stepping stone in allowing the people we served to be all they could be – as independent as possible. As an early supporter and officer of the Legal Center for Handicapped Citizens, I felt an obligation to advocate for the all too long forgotten rights of the people we served. 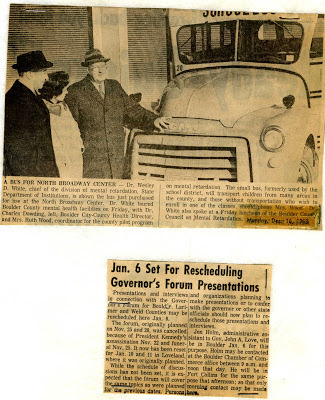 Another area of importance was the state and local education that needed to take place in order to educate the public and facilitate the delivery of service. In this domain, I worked with the local legislators, the Boulder Chamber of Commerce, other human service agencies, the Governor’s Council for Developmental Disabilities and the Federal Office of Developmental Disabilities. I viewed all human needs to be a community responsibility and so I worked with the business community and the human service network to gap and unify efforts to meet the needs of the community. A few weeks back, I wrote a post about how we seem to be driving in reverse when it comes to funding for services for individuals with one or more developmental disabilities. While that is mostly disturbing news, there is some surprising good news that has resulted from this shortage in funding, not just here in Colorado but across the nation. The good news is that many providers have embraced this challenge, and in turn have taken the lead in coming up with the best ideas and the best solutions. Providers have been the ones coming up with creative and cost effective ways of providing services that have truly been revolutionary. They have embraced technology, they have improved their training and recruiting, and they have made the adjustments necessary to meet the ever changing (and growing) set of regulations without losing sight of what really matters – the people they serve. Providers know how to get the job done. I wonder, though, if our regulatory leaders are following suit. Are they looking at the innovations taking place in the field and adjusting regulations to meet the new realities? Are they actively searching and documenting best practices developed and implemented by providers? Are they seeking out innovations that can be replicated system-wide to save money while improving services at the same time? Believe me, many answers to the challenges we face are already out there. We’ve had answers to some of our most pressing issues for decades. We just need to pay attention. We need to ask questions. We need to listen. Listening closely often proves to be quite revealing. We all know resources are tight. If we don’t do a better job of using what little we have wisely, we put an already vulnerable population at even great risk. The time has come to ask questions, and more importantly, to listen to the answers that we already have. Here’s a story that is a great example of a collaboration that is a “win” all around. On Friday, December 14, participants in Imagine!’s Longmont CORE/Labor Source photography class traveled to Denver to participate in a study at Assistive Technology Partners, a branch of the University of Colorado School of Medicine. Assistive Technology Partners work to improve the development of and access to assistive technology for people with physical and cognitive disabilities. Although Imagine! has had a number of groups participate in various studies at Assistive Technology Partners, testing everything from cell phones to task prompting systems that assist employment, this particular study was especially relevant to the photography class because they were testing a small Cannon digital camera. Their input will give the researchers important information about which features of the camera are accessible and which features are more challenging to use. Participating in these studies is a great opportunity for individuals served by Imagine! to be a part of the “big picture” (pun intended). Their valuable feedback helps to improve the accessibility of everyday items for the broader community, as well as for individuals with disabilities. Thanks to Imagine! employee Meagan Rountree for sharing this story and photo. Pictured above are the CORE/Labor Source class members and two Assistive Technology Partners researchers. Welcome to the very first edition of “50 Years, 50 Stories,” where I will be sharing stories on this blog from a variety of individuals associated with Imagine! (and the many other names our organization has operated under throughout the years) in celebration of our 50th Anniversary. Since this is the inaugural edition, it seems like it makes sense to start at the beginning. Below is a remembrance from Ruth Wood, who in 1963 became the very first Executive Director of what was to eventually become Imagine!. Sadly, Ruth is no longer with us, so what you see below is what she wrote back in 1988 about the formation of Imagine! 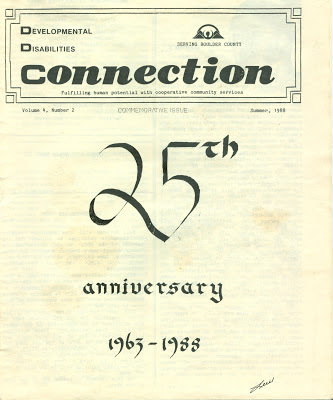 for the organization’s 25th Anniversary. Please note that some of the language below is no longer considered politically correct. I wanted to be true to her words and not change the language simply to fit our more recent sensibilities. Even if she didn’t use language that is considered appropriate today, it doesn’t change the fact that her heroic efforts changed the lives of so many back then, and established a foundation for Imagine! that enabled the organization to still be in operation and changing lives for the better a half century later. Until 1963, there were very few private or community programs for the severely mentally retarded persons anywhere. Parents would not have preferred to keep their children at home if adequate programs had been available, and the state also wanted to reduce the ever growing need for custodial care in the state institutions. 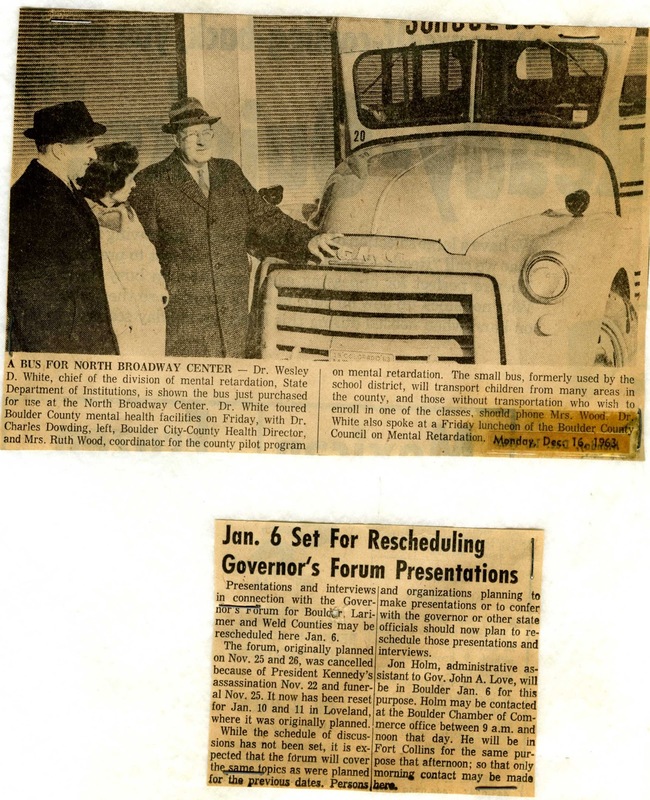 ﻿﻿﻿﻿So in 1963 the general assembly established House Bill #121, providing for a pilot program relating to community centers for mentally retarded and seriously handicapped persons. It was to be a demonstration utilizing local resources and the cooperation of existing agencies. Boulder County was chosen especially because there was local support and interest, already providing limited services through the non-profit Boulder County Sheltered Workshop in Boulder and the Tiny Tim Center in Longmont, as well as cooperative agencies such as Easter Seals, Health Department, Welfare, C.U. and school districts. Previously, several meetings had been held by the agencies, and a proposal had been made to the state requesting to be chosen for the pilot program. Numerous other counties had also submitted proposals. However, Boulder was chosen. The agencies formed a board and became incorporated as a large entity. They chose the name Boulder County Interagency and Citizens Council on Mental Retardation, and many name changes have been made since then. Agencies represented on the first council included: County Commissioners, the two school districts, Tiny Tim and the Sheltered Workshop, the Boulder Association of Retarded Children, County Health Department, County Welfare Department, and C.U. I was granted a leave of absence from the Boulder Valley School District, and started working as the Coordinator and Administrator of the program. I had already served and been an officer on several of the cooperating boards, so it was not as difficult as it could have been. We had such tremendous support from people and agencies in all the towns in the county. The Jaycees and labor union members responded immediately by preparing rooms that could be used for classes and staff in the old county hospital buildings at Iris and Broadway. We expanded programs and initiated new ones. We started the Infant Stimulation and Early Identification programs, and helped with the Boulder County Health Department in starting a Diagnostic and Evaluation program. Classes were started for school aged children in cooperation with the school districts, and were provided for all enrollees by C.U. so we could qualify for the funds at the beginning. Later, services were provided by psychologists from the school districts, and the Mental Health Center provided two psychologists to meet with the staff and parents. 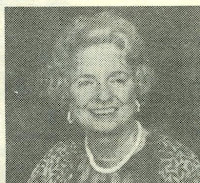 In addition, the Broomfield Foundation for Retarded Children was started with the cooperation of the parents; recreation programs were started through both the City of Boulder and the YMCA, as well as a hot lunch program, a Mothers Club, and for quite awhile we provided speech therapy through Easter Seals. Another very special achievement was the cooperation with the University of Colorado in producing the 16m film on our programs called, “These Too Are Our Children.” (Editor’s note – we are trying to track this film down and will share it if we find it.) Many other benefits were continually offered to the people of Boulder County. The Board of Directors was so very fortunate to receive the support and cooperation so that it could achieve its goals: to serve the handicapped, to help them achieve their potential, to alleviate the concerns of families concerning long-time care and programs, and to help the people we serve have a healthier, happier, and more rewarding life. I feel privileged to have been part of this program, and am gratified that there is still an outstanding staff and board of directors to continue this service. Fun "50 Years, 50 Stories" bonus! A couple of newspaper articles from the very early days of Imagine!. Click on the image for a bigger view. 2013 marks Imagine!’s 50th Anniversary! We’ll be celebrating this important milestone throughout the year with great stories and fun events, and I hope you will join us!